Yarram lies on a flat coastal plain near the Tarra River, with the Strzelecki Ranges to the north and west. The South Gippsland Highway passes through the town which is 170 km south-east of Melbourne. The Tarra Creek pastoral run encompassed the area from the mid-1840s. In the early 1850s a flour mill and sawmill were constructed on the east side of the Tarra River, which was soon bridged. A small township began to develop on private land on the west side of the river. This was named Barkly, after Victorian Governor Sir Henry Barkly, but soon became known as Yarram Yarram, the parish name. Yarram is an Aboriginal word thought to mean plenty of water. By the late 1850s there were several stores serving the surrounding farming area. A mechanics' institute hall was constructed in 1860, a school commenced in 1861 and a hotel was soon licensed. During this period, all communication for north Gippsland was through the port, Port Albert, to the south. Tarraville, on the route to the hinterland, was the largest town in Gippsland and the administrative centre of the Alberton Shire, proclaimed in 1864. Yarram grew slowly at first, constrained by the gradual release of private land for sale. Development gained pace in the 1880s, spreading south with numbers of small allotments sold. Many of the new streets were named after early landowners. A police station, court, new mechanics' institute hall and churches were constructed, as well as commercial premises. The town served an extensive agricultural district. 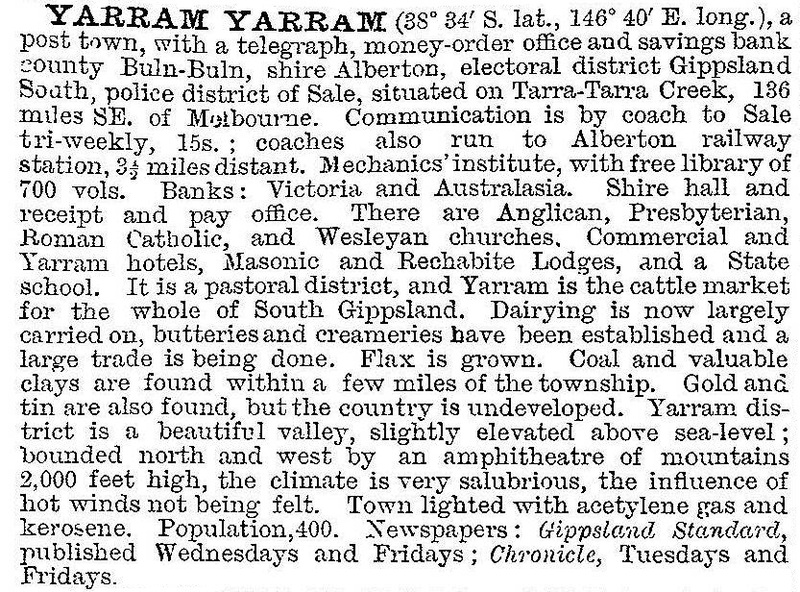 From the early 1900s, large areas of land were selected in the hill country to the north and west of Yarram. The main enterprise was dairying, supplying cream to the butter factory established in 1891. Sheep and cattle grazing were more common on the plains to the east and south. From the 1940s the steep terrain, weeds and isolation of the hill country caused the abandonment of many farms. Much land was reforested with hardwood and softwood plantations by the Forests Commission which established an office at Yarram in 1945. From the 1950s the Housing Commission and several housing cooperatives constructed many new homes in Yarram. Some secondary industries, such as a clothing factory, a brick and tile factory and a plaster works, began operations. Several motels and caravan parks were established, capitalising on interest in the beaches to the south and the mountain scenery in the hills to the north. However, from the 1970s rural industries experienced a general decline. The butter factory also manufactured casein from the 1960s, but after several mergers ceased production in 1987. The railway line eventually closed in the same year. Yarram suffered a loss of population, but is still a provincial centre. It offers a wide range of administrative and commercial services and is the regional headquarters for the Department of Natural Resources and Environment. As well as a hospital, a number of medical and social services are centred there. There are State primary and secondary schools (166 and 316 pupils, 2014), a Catholic primary school, golf, swimming and bowls venues, a showground, a caravan park and a customer service centre for the Wellington Shire Council. There is a weekly newspaper. The Tarra Festival is held each Easter. There are several prominent buildings along the main (Commercial) street, including the heritage listed courthouse (1907), the former Union Bank, the Regent Theatre, the Club Hotel and the former butter factory.